Editor’s Note: The following is the text of NPI founder Andrew Villeneuve’s testimony in support of Senate Bill 5339, prime sponsored by Senator Reuven Carlyle. This bill would end the death penalty once and for all in Washington State. Thank you for hearing Senate Bill 5339 this morning. On behalf of the team at the Northwest Progressive Institute, who work tirelessly to raise our region and country’s quality of life through insightful research and imaginative advocacy, I urge you to advance this vital legislation with a “do pass” recommendation so that it can be considered by the full State Senate. Of the following list of choices, which punishment do you prefer for people convicted of murder: life in prison with NO possibility of parole, life in prison with NO possibility of parole and a requirement to work in prison and pay restitution to the victims, life in prison with a possibility of parole after at least forty years, or the death penalty? Our survey of six hundred and seventy-five likely 2018 Washington State voters was in the field May 22nd-23rd, 2018. The survey used a blended methodology with automated phone calls to landlines and online interviews of cell phone only respondents. The poll was conducted by Public Policy Polling for NPI, and has a margin of error of +/- 3.8% at the 95% confidence level. What we found most striking about the responses were that not a single subsample within the survey favored the death penalty… not even Donald Trump voters. Trump voters favor life in prison by the slimmest of margins: 48% of them picked one of the three alternatives, while 46% want to keep the death penalty. What this tells us is that there is broad agreement across the ideological spectrum for getting rid of the practice of putting people convicted of murder to death. Washingtonians increasingly agree: there is no humane way to kill someone. Life in prison without the possibility of parole should replace the death penalty. There are many, many excellent reasons to abolish the death penalty, but perhaps the best one of all is that judges and juries are human. They make mistakes. Consequently, our criminal justice system cannot guarantee that an innocent person will never be sentenced to death for a crime of murder. On that basis alone, we should abolish the death penalty. A person sentenced to life in prison can be exonerated for a crime they did not commit, and freed from prison. The Innocence Project has helped free dozens of wrongly convicted people since its inception in 1992. A person killed by the state, on the other hand, cannot be brought back. Once someone has been killed, they’re gone. If we truly value life, liberty, and the pursuit of happiness, then we need to end the death penalty. Our polling clearly shows that Washingtonians of all political persuasions are ready. Last autumn, our Supreme Court converted all existing death sentences to life imprisonment when it found our existing death penalty statute unconstitutional. Now the Legislature has an opportunity to finish the work that needs to be done. Let’s get this discriminatory and unjust statute off our books, and let the world community know that here in Washington, we value human rights. 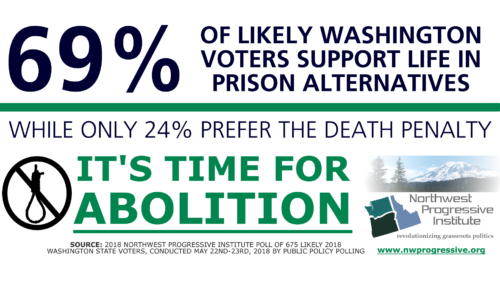 LANDMARK VICTORY: Washington State Senate votes to abolish the death penalty! I really began to question the death penalty when the death penalty was taken off the table in the OJ trial. It seems that as a celebrity, his life was considered more valuable. It is not up to the courts or judges to put value on the life of defendants or victims. © 2019 The Northwest Progressive Institute. The Cascadia Advocate loaded in 0.240 seconds.